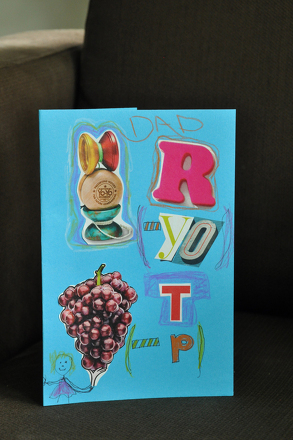 Looking for a unique Father’s Day card or poster to make with your child? This one will double as a card and an exercise in playing with words. More importantly, it will make Dad laugh! Explain to your child that a rebus is a message that you send in pictures. Give your child an example of a rebus by drawing an eye, a heart, and the letter “U” on a piece of paper. Ask your child to figure out the hidden message and explain that you'll be making a Father’s Day card using the same technique. Help your child think about the type of message she'd like to send Dad for Father’s Day. Does she want to thank him? Tell him how much she loves him? Tell him what a great dad he is? 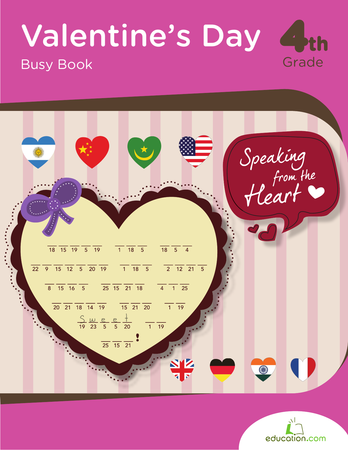 Show your child how to map out the message she wants on her card. To do this make a draft: write out each of the pictures that you've found and make a sentence around them. Brainstorm other pictures or single letters and abbreviations you can use to spell out the rest of the sentence. If you can’t think of any way to represent a message with letters, numbers or pictures, change it slightly until you can. Cut out the pictures from the magazine as well as any large letters or numbers you'll need for your message, and place them on the construction paper. If you can’t find any of the pictures that you want, your child can draw them around the magazine clippings in the correct spots. Glue the magazine pictures into the correct places on the message. Add plus and minus signs between the pictures, letters and numbers as you need them. Place the message on Dad’s chair or simply let your child hand it to him on Father’s Day. Dad will enjoy figuring out the secret message your child has written him! Find out some different types of invertebrates with the clues in this crossword puzzle. Your child will use clues to determine what animal name fits in the crossword puzzle with this worksheet. Practise geology vocabulary with this challenging crossword puzzle. 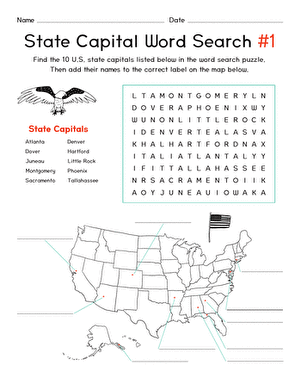 After he's finished the puzzle, challenge him to locate each capital on a map. This worksheet takes spelling practise to the next level by challenging kids to use spelling words like "breakfast" and "vegetable" in a fun crossword puzzle. He'll stretch his spelling and puzzle solving skills with this word fun printable.